This next cake was a small cake order I received. Well, small was the operative word until a last minute change of heart moved it closer into regular cake territory. This customer had recently moved to Aus with her husband and was celebrating her husbands birthday for the first time here together. She said she wanted something special, a homemade ‘Aussie’ cake. 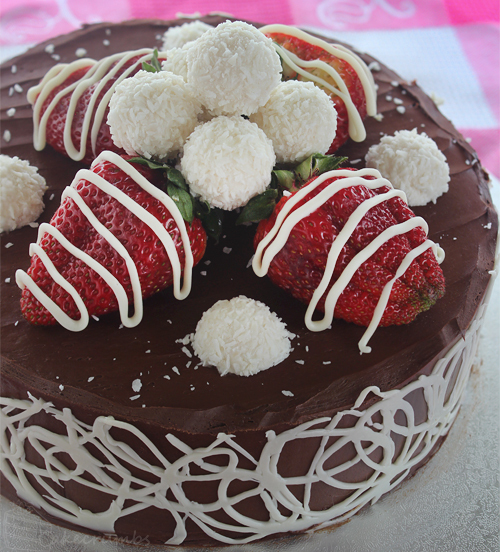 We went over a few ideas and settled on a simple naked sponge with a smattering of chocolate ganache. 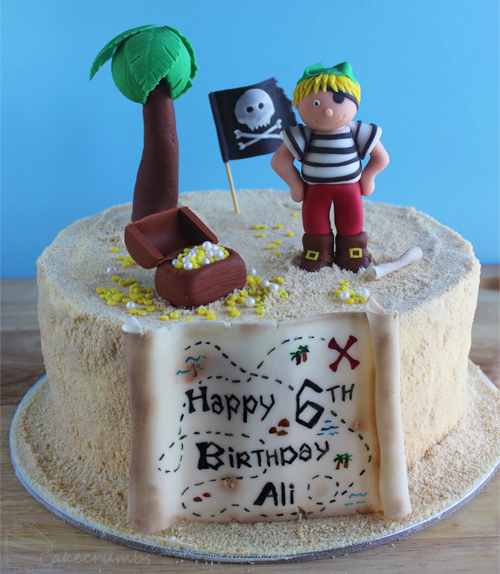 Here’s a quick little cake I did for a customer who was organising a pirate party for her son’s birthday. She got her son to choose the theme, and he responded with a ‘pirate and green’ theme. While she got to crafting all the decorations for the occasion, I set about making the cake to match. A few weeks ago my dad turned 60. Many would view this as an excuse to party and celebrate, but my dad loathes being the centre of attention. Knowing he would hate a surprise party, we decided to opt for a simpler affair and took him out to lunch instead. Behind his thinly veiled protests that he didn’t want to do anything lay an actual excitement at getting to spend time out with his immediate family. If there was any doubt as to his desire to mark the occasion, his incessant talking since about how much he enjoyed it enough to put that to rest. Amidst all his protestations, I did manage to get him to decide on a cake. In fact, the cake was the one thing he agreed to with no hesitation. His cake choices are usually fairly predictable: either sponge or mudcake, but mostly mudcake. I couldn’t even feign surprise then when he asked for a mudcake. The recipe I used is one I reserve for special occasions as it’s a comparatively expensive cake to make. 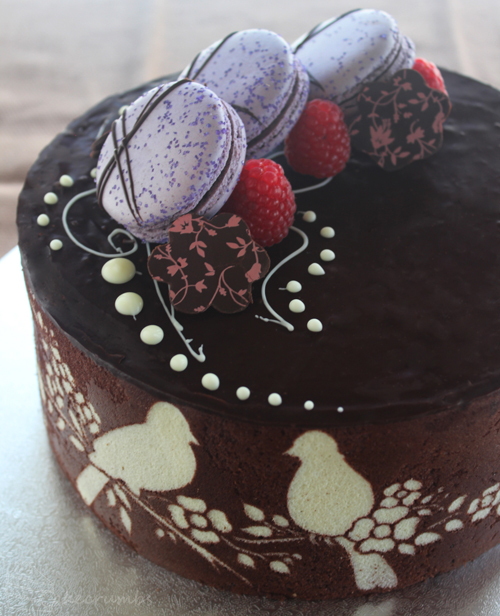 I made it for an order once: the 35cm version has a whopping 2 and a half kilos of chocolate in it. So when I say this cake is chocolate heavy, I really mean it. But the result is completely worth it. This was a cake I was commissioned to do some time ago for a surprise 21st birthday celebration. It was one of those rare moments when the recipient of the cake has no idea what they’re getting, which is both kind of exciting and nerve-racking. The customer mentioned they’d seen the octopus cake I did for a friend, loved it and wanted to get a cake from me as well. Most of the people who’ve contacted me about ordering cakes lately have all been recipients of them as guests at the party of the customer. I have this constant paranoia that my food photos simply flatter my cakes and that maybe they’re not really as good as all my lovely readers tell me they are. So when someone has seen it in person, eaten it, and then decided they want one too is such a wonderful confidence boost for lil ol’ low self-esteem me. The cake they were after wasn’t quote so complex as an octopus. 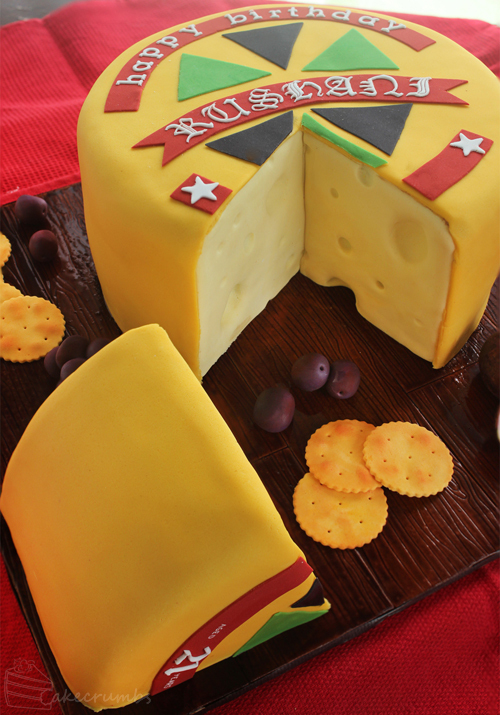 In fact is was a relatively simple concept: they wanted a cake made to look like a wheel of cheese. A few weeks ago I was chatting to my sister about cake, as we do. We were discussing previous cake orders and I mentioned how every toddlers birthday cake I’ve been commissioned to do was for a little boy. I kinda missed pink. Pink and frills and all those other things customers will say they absolutely do not want on a cake for a boy. Not half an hour later, my cousin messaged me asking if I could make a cake that ticked all those boxes. Her niece’s birthday was approaching and she wanted something Minnie Mouse. I was so excited! These are the kinds of cakes I can’t make for customers because of copyright law, so when someone in the family wants one we can go nuts with ideas. I hope you all had a wonderful Easter holiday. I spent mine with my partner and his family, eating way too much food and trying not to eat all the chocolate too. His brother and sister-in-law hosted us all on Good Friday, and on Easter Sunday his parents did. Both his mother and sister-in-law put on an amazing spread of food that we all ate too much of, and that was before we even thought about dessert. I bought along a couple of baked goods for the occasion, baking most of it vegan so everyone could eat some. I made a batch of hot cross buns to bring because they’re lots of fun to make, but also because it’s next to impossible to find any here that don’t contain palm oil, especially not vegan ones. 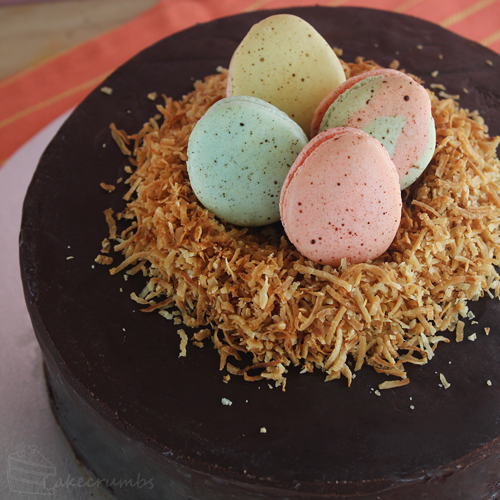 And then there was this Easter-themed cake. Making chocolate cake vegan is so easy. There’s so many recipes that are already incidentally vegan or an easy substitute away from it. This time I decided to spice things up a little with a Mexican chocolate cake.